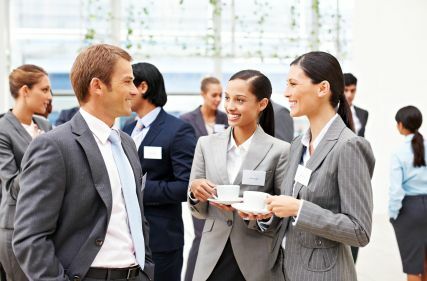 As we head into the holiday season- filled with office parties, customer events and family gatherings, there will be ample opportunity for small talk. Being prepared for small talk is a must-have skill. Even if you are not the most talkative member of your team, there is a way to plan for small talk situations. A technique based off the mnemonic F O R M has become popular for its effectiveness. These are always great topics to open discussion casually with others. Everyone wants to talk about their kids! If that doesn’t feel right, food is one of GSG Financial's co-founder, Jeffrey Bender’s, favorite go to topics. Every city, state, and region has a famous dish, and every person has favorite restaurants. Talk about pizza with anyone in New York, or about barbecue in the South. Asking for food advice or recommendations is a can’t miss conversation icebreaker. This one may be more applicable to non-industry social settings and gatherings. There isn't much need to ask cohorts how long they’ve been doing something. That said, “How’s Business?” is always a great simple go to question at business events. What you do for fun is a cliché question no one really answers in detail. That said, most people love sports and asking questions on pro or college sports teams and current events could lead to back stories and personal histories. Vacation destinations also make for great small talk banter. This could be the trickiest of topics, but the most open ended. On a higher level, broad discussion of the economy (but not politics) and interesting financial news can lead into open ended questions on the person’s opinion or approach to money matters. One note, never offer money advice. These are great go to topics when in light conversation, because they offer gateways to what people like to speak about most; themselves. In any small talk conversation, a person can’t open up or relax with generic or close-ended “yes/no” questions. Remember questions like, “how’s your day going?” are as drab and unanswerable to someone now as they were when your parents asked you during high school. Effective small talkers love to learn, so they approach conversations with genuine interest and make it easy for people to share. Even if initial small talk has the feeling of being shallow, you never know what new idea, tip, or relationship can come from it. Great questions get people talking about their passions and observations. Use F O R M to learn and help unearth what others enjoy talking about. If you do that people will consider you a great conversationalist even if, ironically, you do less of the talking.